Whole Person Process Facilitation is a highly dynamic, participative meeting methodology. 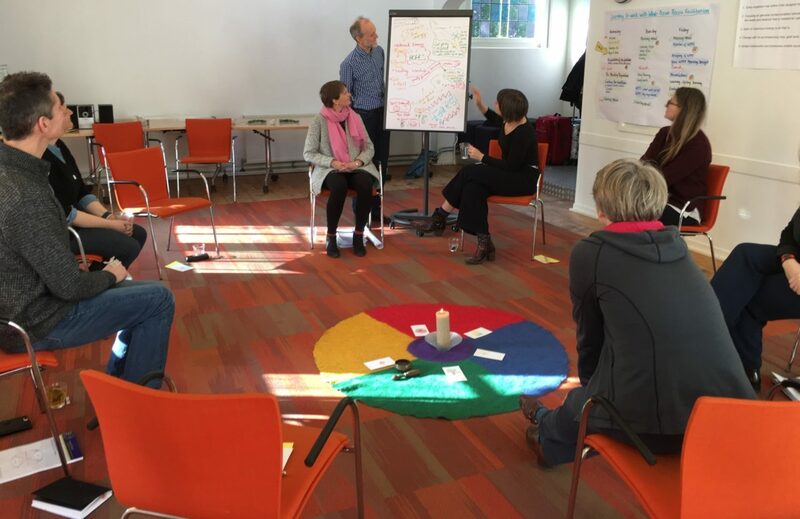 Whole Person Process Facilitation (WPPF) is the name given to a highly dynamic, participative meeting methodology designed to integrate the wisdom of the group as well the individual, during the meeting. The WPPF methodology delivers both powerful short and long term results from meetings. Energy, ideas and discussion from meetings are transformed into constructive action, with participants embracing responsibility and leadership around the topic at hand, be that a product, concept, question or strategy. In the longer term, by using the WPPF meeting methodology, team members become increasingly more engaged, creative and open. This engenders resilience among people and teams in dealing with the dynamics of change from both within and outside organizations. In this 3 day training you will learn how to use meetings as a seriously effective way to utilize all of the human capacity in an organization. You will discover not only how to prepare, run and follow up on meetings in a new way, but will also learn to build your own capacity to run a WPPF meeting. After the training you will have access to a peer-to-peer mentoring circle for ongoing learning. Participants of WPPF meetings have described them as “efficient, effective and highly productive”; “stimulating maximum participation”; “generating high levels of creativity”;“enabling teams and leadership to emerge”; “facilitating communication and learning”; “improving staff morale”. WPPF can help you make meetings really deliver, through embracing the wisdom, capacities, talents and diversities of a group. Whether meeting in person or online, this methodology works effectively in meetings with one or one hundred people. WPPF is a module of the Genuine Contact™ Programwhich develops a culture for extraordinary leadership as the path for organizational success. This training will help anyone, such as facilitators, managers and (team) leaders, who organize and/or conduct meetings, whether they be regular meetings, workshops or trainings. Anyone who creates and carries out participative processes, within their organization or community, will also find this training highly beneficial. This training is also excellent for those who would like to deepen and augment their facilitation skills, such as trainers, facilitators, consultants, Organisational Development leaders and managers. The WPPF training is also for people who have taken other similar courses and want to build experience and practice in the Genuine Contact™ approach to leadership and organizational success. Doris Gottlieb (The Netherlands), Thomas Herrmann (Sweden), and Anna Caroline Türk (Germany) are joining forces to offer this training. They are highly dedicated to this approach and invest much of their energy in the development of the Genuine Contact Program and have worked closely with Birgitt and Ward Williams, founders of the Genuine Contact Program, for almost two decades. Working together, they each bring their own specific strengths, expertise and practical insights, to provide you with a rich and varied learning experience. They teach in English, Swedish, German, Dutch, and Spanish. As consultants they have assisted organizations such as Volvo, Etsy, World Wildlife Fund, Dropbox, City of Gothenburg, Stena Line and the Karolinska Institute, Emancipator, Rotterdam School of Management – Erasmus University, Sounds of Change, in learning and applying the Genuine Contact approach to increase organizational success. Design and lead meetings from two hours to several days with ample room for creative solutions to be identified. Designing meetings includes preparation, running the meeting and follow up. Apply the knowledge that people all learn in different ways, and have different capacities, and learn how the meeting structure harnesses their individual capacities, so everyone can participate at their best. Apply a practical means for working with the information, knowledge and wisdom already existing within the organization. How to use WPPF in an online meeting – a truly revolutionary change to ensure powerful distance meetings. Maintain high energy levels throughout meetings. The language of the workshop will be English however Dutch, Swedish and German and Spanish can also be used. There are several price options depending on the type of organization you work for. Earlybird: Book by 1st May 2019 for an Earlybird 10% discount on the price of the training. Group rates: If you would like to come together with one or more colleagues from the same organization, you will each receive a 10% discount on the price of the training. More instructions on registration page. We recommend that you stay at the venue, if possible. It is also possible to join as a non-residential participant. We offer three different price options for the a 2 night overnight stay. Prices include dinner on the 16th and 17th of October and breakfast on the 17th and 18th of October. Language: The language of the workshop will be English however Dutch, Swedish and German and Spanish can also be used.